Pars Museum is a relatively small yet magnificent building constructed inside Nazar garden during late 18th century when Karim Khan Zand was in power in Shiraz, his capital city. It‘s part of a royal project where several buildings were built for the administration of Zand court and the public use people of Shiraz. Other buildings at this project include Arg-eKarimkhani(Karim Khan Citadel), Vakil Mosque, Vakil Bazaar, Vakil Bathhouse, etc. 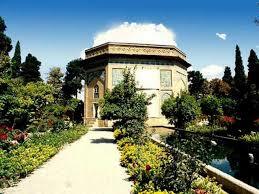 LOCATION & APPEARANCE OF PARS MUSEUM Pars Museum is a pavilion located inside Nazar garden, which goes back to Safavid period. The garden used to be larger than what it is today, but it‘s large enough to accommodate the building of this museum. The pavilion was called KolahFarangi (foreign hat) building, a name attributed to similar buildings constructed after the influence of European arts in Iran.The building itself is octagonal in shape from outside. The exterior is decorated by beautiful tiles decorated with floral patterns and tree-of-life design where lots of birds and flowers are depicted in delicate harmony. The multi-sided design of this structure makes it look like burial buildings.Since 1934, it was decided that it should be used as a museum. Therefore, some very exquisite items have been displayed inside the showcases of Pars Museum. The interior walls are elegantly embellished with Zand style frescoes and specific color combinations of the period, dark red and gold. The inner space of the museum resembles a cruciform plan where showcases are arranged. On the walls, there are also, small items inviting art-appreciating eyes to themselves. Karim Khan received dignitaries, officials and other VIPs at this building. As a matter of fact, it was a small hall for particular meetings. 25 ATTRACTIVE ITEMS ON DISPLAY AT PARS MUSEUM Some of the fascinating water-color paintings of Suratgar-e-Shirazy, the well-known Zand period artist, are on display here. There are beautiful calligraphic styles on old Qorans, spells, etc. with high levels of artistic value. Also some very interesting armors and cold weapons (daggers and swords) are on display.The burial place of Karim Khan Zand is also here at this pavilion. His tomb stone can be seen inside as well.